Terence Kealy is an Industrial Design Consultant at Design Partners, specialising in designing solutions for the healthcare sector. He has worked with a broad spectrum of global clients such as Abbott, AbbVie, Medtronic, Boston Scientific and Shire as part of a multidisciplinary team dedicated to delivering better experiences for healthcare consumers. Terence believes that putting people front and center in the product development process results in more meaningful solutions that ultimately resonate with people’s motivations. The importance of medication or medical device packaging can be easily overlooked. To most, it means protection in transit, maintenance of sterility, a home for instructions or ensuring a small footprint that works for logistics. While these fundamental things are important, packaging has so much more potential for the end user. Packaging has the ability to delight, the ability to help people understand, the ability to empower and the ability to make life more meaningful and enjoyable. Packaging is an extension of a companies brand, and a significant touch point which has the potential to win or lose hearts. In the Medical Device and Pharmaceutical industries, packaging comes with lots of individual challenges from quality, regulatory, supply chain, manufacturing, operations or finance, but none of these should limit our ambition to provide the end user with a superior product experience. These limitations do not mean that improvements cannot be made, but rather serve as guiding points in the design process. Through the application of good design practice, even within these constraints, there is potential to make a huge impact to all stakeholders, from the manufacturer to the healthcare provider and right through to the patient. We employ an established Human Factors Engineering process combined with psychology models based on positive reinforcement, motivation and behaviour change strategies. We believe in creating motivating experiences for patients that give them the ability and confidence to selfmanage. We do this by creating engaging experiences designed to bring about behaviour change based on intuitive usability and the removal of barriers to adoption and self-management. For health care professionals (HCPs) we create empowering solutions enabling them to do their jobs efficiently and effectively. We believe in providing tools that enable HCPs to build patient self-confidence and independence. Packaging in the healthcare space is not a means to an end, but rather an important component in overall solution provision. It is an opportunity to create a positive user experience that benefits both patients and HCPs as well as build positive brand reinforcement and commercial success. We employ an established Human Factors Engineering process combined with Psychology models (based on positive reinforcement, motivation and behaviour change strategies). A more confident, motivated user is in a far better position to learn and engage with product. Through the application of these methods we remove usability barriers that will result in confident users who are motivated and engaged. This leads to a better understanding, better adherence and better long term efficacy.  To design a complete and positive user experience it is important to apply the following principles. In healthcare, having two end users (patients and the HCPs) is a normal challenge, but it is also an opportunity. It is well documented that patient engagement and confidence in a medical course of action is dramatically improved by the quality of interaction between patient and healthcare provider. Understanding the needs of both users is of the utmost importance. If we can empower the healthcare professionals with tools that maximise the quality of these engagements, we will ultimately improve care for patients. If we build empathy through understanding patient needs, we build patient confidence and engagement. How has the healthcare consumer arrived at this point? What are they thinking? What are they feeling? What are they doing from step to step? What are those steps? What are their emotional wants and needs? These answers give us opportunities to address these emotional needs and support end users, while also providing opportunities to improve interactions between patients and healthcare professionals. The mapping of the user journey allows insight in to specific opportunities to build positive experiences and improve the patient engagement. Essential to creating a positive user experience is to understand the specific context of use and the number of possible variations that exist. Understanding both where and how a user interaction takes place is always a significant factor in the effectiveness of a packaging solution. Understanding the appropriateness of a solution across various environments, will help to anticipate the users needs and expectations. 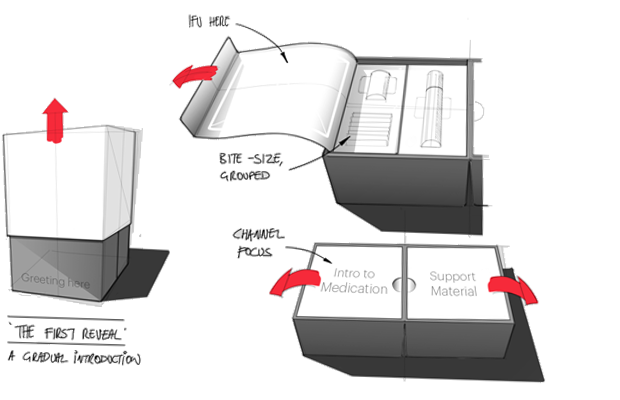 Product packaging in the healthcare sector should be seen as an opportunity to create a more complete user experience. By addressing the needs of healthcare consumers and HCPs, positive patient physician engagement is facilitated. This approach means that the first engagements are more likely to be won, building longer term consumer loyalty and ultimately, commercial success for providers.